Traffic cameras may be banned in Iowa in the near future. A bill that could ban all traffic cameras statewide is currently going through the Senate of the Iowa legislature. Although there were never any traffic cameras in Cedar Falls, if the bill passes, all traffic cameras will disappear from cities like Des Moines and Cedar Rapids. For people to get ticketed for speeding or running a red light, a police officer would have to catch them in the act rather than relying on a picture. Many Iowans disagree on the safety, constitutionality and privacy of traffic cameras, but many support the proposed ban. “This issue to me is about freedom. It’s about a surveillance culture that is overtaking our society. I have 10,000 signatures on my desk wanting the state legislature to ban these cameras. 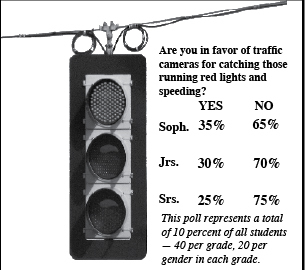 A recent grass roots poll taken in the Waterloo-Cedar Falls area showed 94 percent of participants wanted traffic cameras banned. I believe this is because people don’t want a surveillance camera culture watching everything we do,” Cedar Falls Representative Walt Rogers said. A portion of the controversy is over whether traffic cameras actually make the roads safer. Social studies teacher Kevin Stewart said he believes that this is exactly what traffic cameras are meant to do. “You have to remember driving is a privilege, not your right, and so traffic cameras are designed to assist law enforcement in public safety,” Stewart said. Despite the intended purpose of traffic cameras, they also may create different traffic issues like senior Erin Harris described. “It [traffic cameras] might cause more problems than it actually makes the situation better,” Harris said. As strange as it may seem, Harris’s thoughts questioning the safety of traffic cameras are valid. A recent safety evaluation of red-light cameras by the U.S. Department of Transportation showed that even though the presence of traffic cameras reduced the amount and severity of right-angle crashes at those particular intersections, it also increased the amount and severity of rear-end crashes at those intersections by nearly the same amounts. Another issue that English teacher Judy Timmins proposed is the possibility of the surveillance of some interstates making other routes more dangerous. “When people know someone is watching them, it changes their behavior. While it may make the interstate more safe, will they just take a different route and break the same traffic laws somewhere else?” Timmins asked. Junior Delane Klemensen said she believes traffic cameras can help in situations they were not created for. “We definitely need more cameras, so if there’s an accident we need to know who’s fault it is,” Klemensen said. Another junior, Justin Van Heiden agreed but also noted a different purpose of the cameras. “They’re just a way for the government to get money,” Heiden said. School Liaison Officer Mark Abernathy, who has no opinion regarding the cameras, also acknowledged the possible financial benefits.